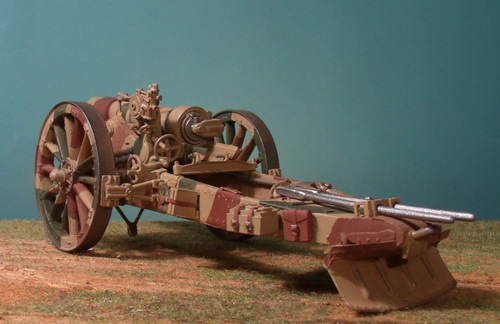 This Resicast kit (R351233) can be built as a World War 1 or early BEF World War 2 howitzer. The kit includes the gun limber. A Belgian company, see their website at www.resicast.com/. 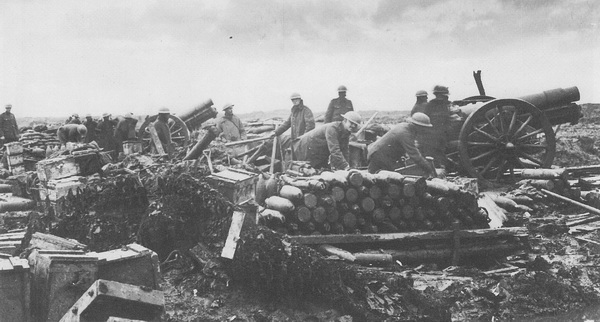 This photo was taken from Allied Artillery of World War One by Ian V. Hogg, page 71. With a maximum range of 9,500 yards, the battery would be positioned about 5.5 miles from its target, relatively close and within range of German long-range counter-battery fire. 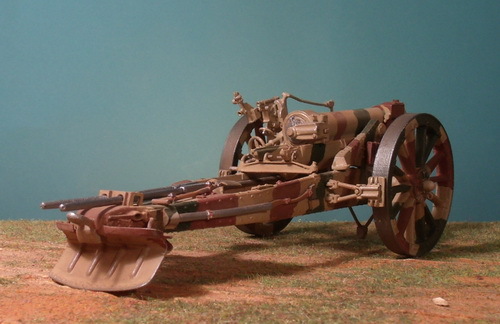 BEGINNINGS: The kit is one of the best model kits I've built. All of the parts have part numbers attached to their sprue. The fully-illustrated instruction booklet is a photo step-by-step guide. The parts require some sanding but are cleanly cast. The fit of parts is excellent. If alternate positions of display are encountered, the modeler is well warned as to when a part has to be fitted. 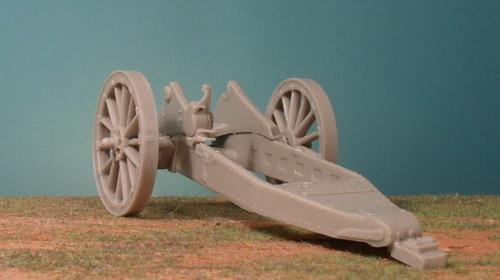 Here, in this photo, the large carriage and axles have been glued but the wheels are attached, not glued, for display. CRADLE AND BARREL: Before gluing the small attachment parts that secure the cradle's trunions to the frame, the instructions warn you about being able to elevate the barrel in which case a sparing amount of glue carefully placed will do the trick; otherwise, a "hard" gluing will freeze the cradle and you will be stuck with that position. I carefully glued the small pieces to preserve movement. LIMBER CONSTRUCTION, PART 1: The limber is quite simple with few parts. The side rails were a bit too flimsy so I cut them off. I drilled holes for thin piano wire and glued them in place. I did this because there wasn't enough "meat" at the bottom of the side rail for drilling. I covered the piano wire with brass tube cut to the same length as the original. LIMBER CONSTRUCTION, PART 2: The front hitch is attached to the frame by two thin resin bars. I reinforced each bar with a piece of gardener's wire shown above as dark green. 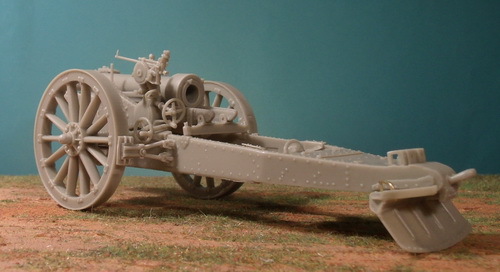 FULLY ASSEMBLED 2: With the exception of four small parts and all of the tools and storage boxes, the model is completely assembled as shown above. PAINTING, PART 1: Most of the tools and storage boxes have been added of which only a few can be seen in the photo above. 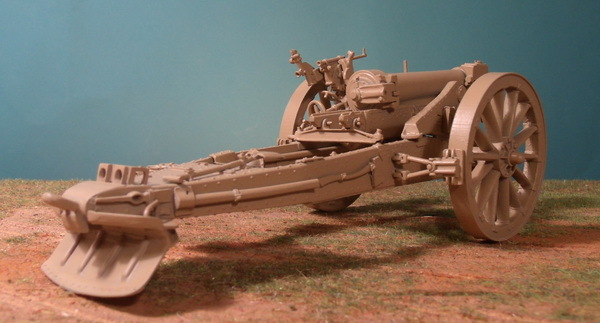 The howitzer and its limber were primed using Tamiya TM87042 Gray Primer (180 ml spray) and allowed to dry overnight. Next, they were oversprayed with Tamiya TM 85046 Light Sand as a base coat to the three-color dazzle camouflage scheme. A close match to this color for hand-painting purposes is Vallejo VC0819 Iraqi Sand. 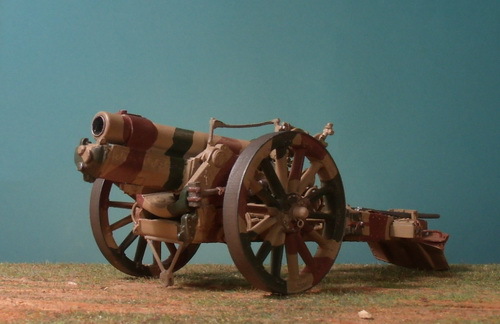 PAINTING, PART 1 (continued) 2: This view shows both the howitzer and limber in their initial light sand color. The other two colors in the dazzle camouflage scheme will be brown and green on the light sand base. 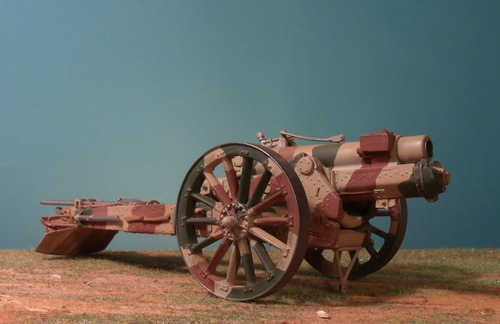 6-INCH HOWITZER CAMOUFLAGE PAINTING: This view shows the completed 6-inch howitzer and limber painted in the mid-war three-color camouflage scheme. 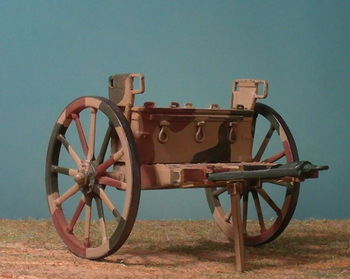 The basic color Tamiya TM 85046 Light Sand which was already sprayed overall was supplemented by two Vallejo colors that were hand-painted: Vallejo VC0846 Mahogany Brown and Vallejo VC0823 Luftwaffe Camouflage Green. The all-metal "tires" on the rim of the wheels were painted with Vallejo VC0863 Natural Steel. Edges on the model were rubbed with graphite to show wear. Overall dusting was done with MIG P028 Europe Dust. 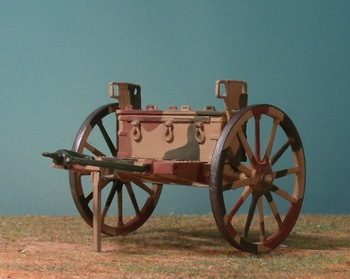 6-INCH HOWITZER LEFT REAR VIEW: The howitzer is liberally "sprinkled" with artillery implements and storage boxes. The sighting equipment is a small model in its own right. 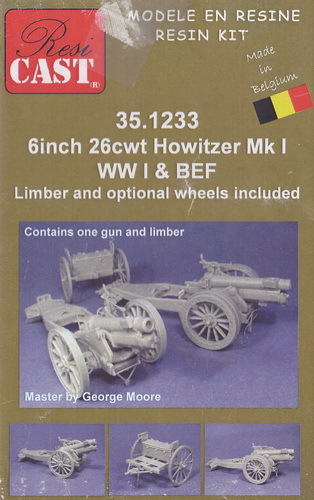 6-INCH HOWITZER LIMBER VIEWS: These two views show simple structure of the limber. Parts went together well and without any difficulty. Hogg, Ian V. Allied Artillery of World War One. Ramsbury, UK: The Crowwood Press, Ltd., 1998. Clarke, Dave. 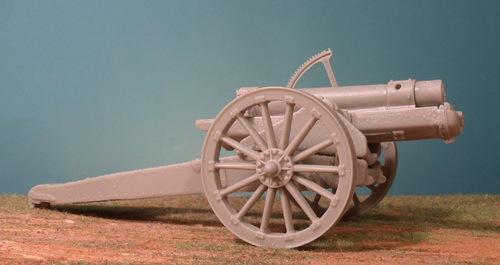 British Artillery 1914-19, Heavy Artillery, New Vanguard No. 105. Botley, Oxford, UK, 2005.